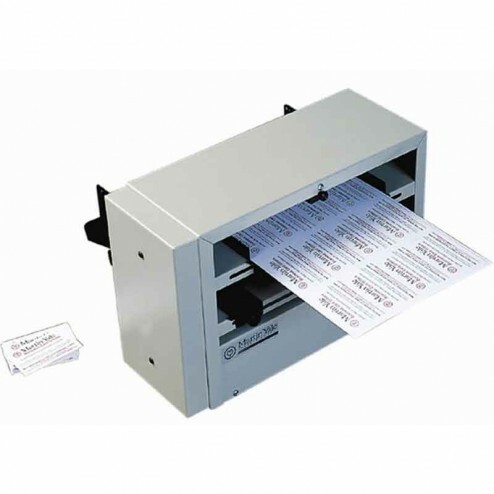 The Martin Yale BCS212 Business Card Slitter saves time and money. The Martin Yale BCS212 accommodates 8.5" x 11" stock and creates finished product in 2 passes. Unit is available in 12-up format. Premium features include perfect cuts, catch tray receptacle and adjustable feed to accommodate different types of material thickness. It is important to note that your stock must be centered and square to the page, with equal registration on all sides. Finishes by taking the 4-up sheets, then cutting them down to 2" x 3-1/2"